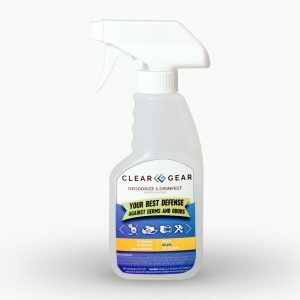 Who Uses Clear Gear Spray? Re-wearing bacteria-ridden personal protective equipment puts you at risk for contracting diseases like MRSA, staph, herpes, and the flu. The National Tactical Officers Association (NTOA) tested Clear Gear and rated our spray a 4.65 out of 5! Great for disinfecting facilities and equipment in one easy to use step. Protect your Gear. Stay healthy. Eliminate Odor. To prevent infections and get rid of the source of odors, you need more than just soap and water, or air freshener. 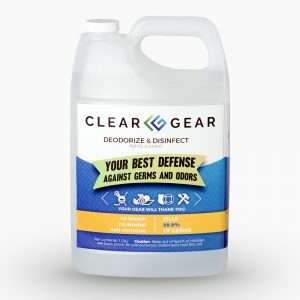 Keep yourself and your co-workers healthy and odor-free by disinfecting and deodorizing your personal protective equipment with Clear Gear Spray. Simple to use – just spray on and let dry! 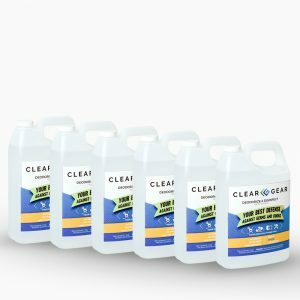 Get the latest Clear Gear Spray promotions and news by subscribing to our e-mail list! 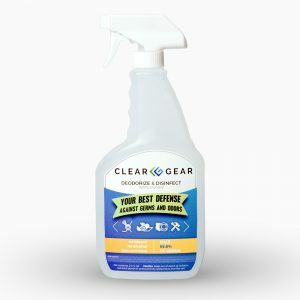 Clear Gear is made in America and EPA approved!